Fafnir – Nordic Journal of Science Fiction and Fantasy Research, Volume 3, Issue 3, pages 74–76. Fantastic Transmedia: Narrative, Play and Memory Across Science Fiction and Fantasy Storyworlds.Basingstoke: Palgrave MacMillan, 2015. ISBN 978-1-137-30603-6. Quite recently “transmedia” and “transmediality” have become buzzwords in media and cultural studies. Drawing on Henry Jenkins’ conceptualization of “transmedia storytelling,” scholars have started to pay attention to how stories and storyworlds develop on and expand to various media. 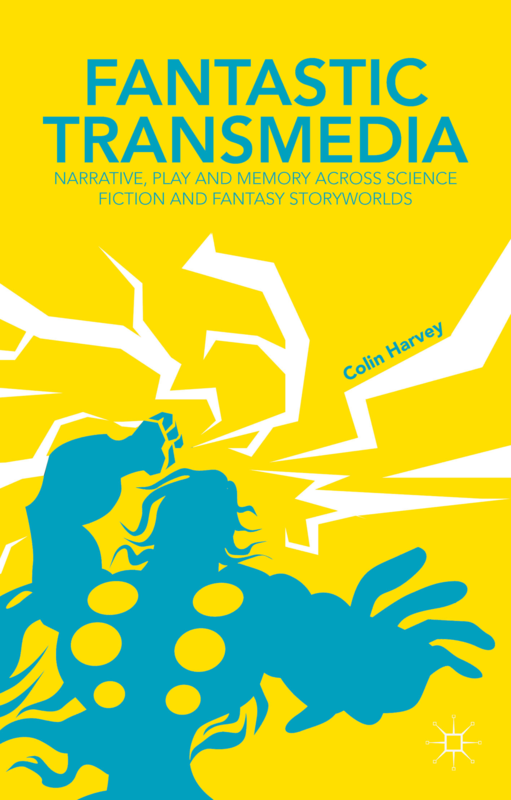 In Fantastic Transmedia: Narrative, Play and Memory Across Science Fiction and Fantasy Storyworlds Colin B. Harvey focuses especially on transmedia storytelling in fantasy genres. Harvey argues that science fiction and fantasy have, in fact, established themselves “as dominant modes of transmedia storytelling” (1), which has to do with their tendency to build fantastic worlds that can easily be expanded on via stories that are told on different platforms (38, 94–95, 189). It is easy to accept this claim as, indeed, many “transmedial worlds” (Klastrup and Tosca) are created around fantasy narratives – a famous example being The Matrix that Jenkins (93–129) cites as an example of transmedia storytelling where each medium and each transmedia extension benefits the overall storyworld. The aim of Harvey’s book is to create a broad definition of transmedia storytelling, one that does not exclude closely related phenomena (1). In doing so, Harvey emphasizes the role of memory in transmedia storytelling, arguing that “transmedia expressions … ‘remember’ other elements in a given transmedia network” in different ways (2). Therefore, transmedia storytelling is not only about the ways transmedia expressions remember the elements of a given network, but also the memories they evoke in the audience (Harvey 3). Drawing on Jason Mittell, Harvey also claims that the dominant mode of transmedia storytelling is not as coherent and balanced as in Jenkins’ conceptualization (87). To better understand and organize the complexity of transmedia storytelling Harvey (186) argues that a transmedia storyworld can comprise of multiple infra storyworlds that together form the broader supra storyworld. The infra storyworlds may be inconsistent with each other. For example, Tim Burton’s Batman films, Christopher Nolan’s Batman films, Arkham videogames, Lego Superheroes and several different Batman comics are all infra storyworlds of their own, but also part of one large Batman supra storyworld (Harvey 186). Moreover, in Harvey’s definition transmedia worlds include non-diegetic content such as toys, collectibles and other merchandise, and these can even expand the storyworld (161, 182). Harvey also discusses the relationship between adaptation and transmedia, which is relevant when one considers the long cultural history of adaptation. For Harvey, memory is a defining factor in distinguishing adaptation from transmedia storytelling. Adaptations tend to remember their so called original versions vertically, so that memories travel only from the source material to the adaptation, while in “transmedia storytelling memories can travel back and forth across the horizontal axis” (Harvey 91). Harvey nevertheless problematizes the relationship between adaptation and transmedia by pointing out that a storyworld can include both adaptations and transmedia storytelling, such as in the case of Marvel’s Cinematic Universe that “both adapts elements of the original comic books and invents new elements, including characters and plots, arguably making it simultaneously an example of transmedia storytelling and an example of adaptation” (9). Thus, it is not always necessary to try to draw clear lines between adaptations and transmedia. Harvey also highlights the impact of legal parameters on transmedia memory. Control over intellectual property is an important factor in determining how transmedia productions can “remember, misremember, forget and even ‘non-remember’ diegetic elements from elsewhere in a … transmedia network” (Harvey 2). To further clarify this Harvey presents a taxonomy of transmedia storytelling focusing on the relationship between the holder of the intellectual property (IP) rights and the creator of the transmedial material. (1) Directed transmedia storytelling describes the idealistic view of transmedia as a coordinated and coherent whole where the IP holder exercises strict control over the material. In (2) devolved transmedia storytelling expansions are created by a third party and often have diegetic distance from the material created by the IP holder, for example featuring a different location, time period or perspective. Unofficial transmedia expansions, created beyond the legal arrangements of the former two categories, Harvey describes as (3) detached transmedia storytelling. (4) Directed user-generated content is transmedia storytelling created by users yet encouraged by the IP holder, whereas (5) emergent user-generated content is the domain of fan works (Harvey 185–190). In including user-generated content Harvey’s taxonomy thus incorporates the audience perspective, which is refreshing as transmedia theories tend to focus on transmedia production or narratives instead of users. All in all, Fantastic Transmedia can be recommended to anyone interested in the connections of transmediality and fantasy fiction. For transmedia theory the main contribution of the book is the instrumentalization of memory as a key concept in transmedia storytelling, and how this concept binds together productional aspects, storytelling, and audiences. Including audience perspective in the definition of transmedia storytelling, indeed, attempts to open a new direction in transmedia theory. It would have been interesting to follow this trajectory further to an even more detailed analysis of how audiences navigate between different transmedia expansions and how this reflects Harvey’s taxonomy of transmedia storytelling. However, it is understandable that it is not possible to cover everything in one book. Harvey’s concept of transmedia memory, as well as his taxonomy, offer new analytical tools for examining the construction of transmedia worlds. The book would also serve as a good textbook on transmedia storytelling, as it offers a comprehensive discussion on the transmedial construction of stories and worlds without forgetting the relations between adaptation and transmedia – or transmedia and intertextuality. However, there are some minor errors in the timing of transmedia material mentioned in the book, for example, Middle-earth Role Playing Game was originally published in 1984, not in 1997, as claimed by Harvey. However, these are minor flaws in an otherwise compelling, comprehensive and well-constructed book. Jenkins, Henry. Convergence Culture. Where Old and New Media Collide. New York: NYU Press, 2006. eBook Collection (EBSCOhost). Web. Klastrup, Lisbeth and Tosca, Susana. “Transmedial Worlds – Rethinking Cyberworld Design.” In Cyberworlds, 2004 International Conference on, 2004. 409–416. IEEE Xplore. DOI: 10.1109/CW.2004.67. Web. Biographies: PhD Aino-Kaisa Koistinen is as a postdoctoral researcher in contemporary culture at the University of Jyväskylä, Finland. Her research interests include media culture, gender studies and speculative fiction. MA Tanja Välisalo is a doctoral student in contemporary culture at the University of Jyväskylä, Finland. She is writing her dissertation on virtual worlds and media fandom.